Diminutive cowboy actor Bob Steele rides again! 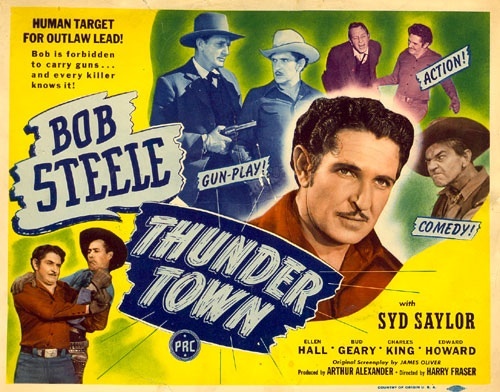 In Harry L. Fraser’s Thunder Town, Steele plays Jim Brandon, a man recently paroled after serving time for a crime he claims he didn’t commit. Things aren’t easy for a parolee out there. As soon as Brandon gets off the stagecoach, he warmly greets the fellow loading it, but the man refuses to shake his hand. Then, while getting some drinking water, the sinister Dunc Rankin (Edward Howard) warns Brandon to stay away from him and his brother. Brandon has a few friends on the outside, however. Matt Warner (Steve Clark), the local sheriff, recommended his parole, even though he doesn’t believe Brandon’s claim that he and his late partner Jim Donovan were framed. Brandon also claims Donovan’s suicide was really murder, and with the help of small-town ballistics expert Peter Collins (Jimmy Aubrey), he intends to prove it. He also has a steadfast pal in Utah McGirk (Syd Saylor), who took care of Brandon’s ranch while he was behind bars. McGirk is hanging on to the ranch by his eyeteeth, and even had to take a job as a cook to make ends meet and keep paying taxes on the ranch. The sheriff firmly reminds Brandon that, as a parolee, he won’t be allowed to carry a firearm. Brandon’s inability to carry a gun means that fisticuffs rule the day. This could have been interesting, but unfortunately he’s too obviously doubled by a stunt homunculus in some of his fight scenes. Also, he doesn’t do anything clever or flashy against his armed opponents, like throwing a knife into their hands or lassoing their guns. Mostly he just flees from them on horseback. The main heavy in the picture is the aforementioned brother of Dunc Rankin, Bill Rankin (Charles King). Unsurprisingly for a P.R.C. western from the ’40s, the bad guy wants everyone else’s land, and will stop at nothing to get it. He even kidnaps Brandon and threatens to kill him in a bid to force a young woman named Betty Morgan (Ellen Hall) to marry Dunc so they can gain possession of the Morgan ranch. On the plus side, Hall is really easy on the eyes (too often, P.R.C. pictures featured some real dogs as the female leads), but if there was a scene that established her relationship with Brandon, I missed it. Also, the 23-year-old actress looks too young for Steele, who looks older than his 39 years. Strangest of all, the only love scene they share occurs in the last 30 seconds of the picture, and ends with a whispered proposal of marriage. While Steele continued to appear in films and on television into the early ’70s, in parts both large and small, Thunder Town was his last leading role. He had a good run, though. He was a star of the silent era, and appeared in more than a hundred westerns. For my money, Thunder Town is the type of western that should have died years earlier. The editing is jumpy, the framing is static, and every scene is lit like a bar after last call, when they turn all the lights on, temporarily blinding the patrons. The actors all deliver their lines in a stilted, cautious fashion, as though their pay will be docked if they flub a line. Steve Clark, who plays the sheriff, is the only supporting player who imbues his lines with any kind of human feeling, and his few scenes with Steele are the only ones that seem as if they belong in a decent movie. Overall, though, the acting is better than the last Steele P.R.C. western I saw, Ambush Trail. Blessedly, Syd Saylor acts like a normal person in this one, instead of the goggle-eyed, rubber-faced mugging machine he was in Ambush Trail. Except, that is, when he’s punched in the face. Then all bets are off. He’s still in this film to provide comic relief, after all. There are also a few musical numbers shoehorned into the picture that aren’t bad, if you like old-school country music that occasionally involves yodeling. Posted in 1946, April 1946 and tagged Arthur Alexander, Bob Steele, Bud Geary, Bud Osborne, Charles King, Edward Howard, Ellen Hall, Harry L. Fraser, James Oliver, Jimmy Aubrey, Lee Zahler, Oliver Drake, P.R.C., Robert E. Cline, Roy V. Livingston, Silver Harr, Steve Clark, Syd Saylor, Thunder Town, Westerns. Bookmark the permalink.